a disposition or bent, especially of the mind or will; a liking or preference: Much against his inclination, he was forced toresign. something to which one is inclined: In sports his inclination istennis. the act of inclining; state of being inclined. a tendency toward a certain condition, action, etc. : thedoor's inclination to stick. 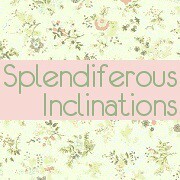 Hence, in so many words, splendiferous inclinations are the preferences for all things splendid.